Bill Belichick's New England Patriots nullified the Los Angeles Rams' offense, conceded Sean McVay after suffering a 13-3 defeat in Super Bowl LIII. 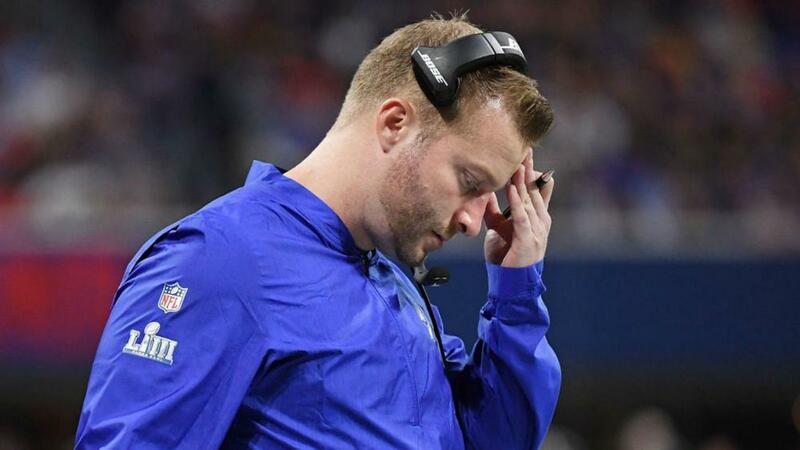 After a stunning season in which the Rams racked up 527 points, McVay - regarded as perhaps the best offensive coach in the NFL - saw his offense muster just a field goal in the lowest-scoring Super Bowl in history. They went into the fourth quarter at Mercedes-Benz Stadium with the game tied at 3-3 but, after Tom Brady led a Patriots touchdown drive that ended with a two-yard score for Sony Michel, Rams quarterback Jared Goff threw a crucial interception to Stephon Gilmore that effectively ended Los Angeles' hopes of lifting the Lombardi Trophy. Goff completed just 19 of his 38 passes for 229 passes in a dismal showing, but McVay put the blame all on himself. "Definitely I got out-coached, I didn't do a good enough job for our football team," McVay told a news conference. "This is going to be a very humbling tough one that you do learn from but you've got to demonstrate that mental toughness and that's all I know how to do. "I never enabled us to get into a rhythm offensively, we didn't have any third-down conversions the whole first half, it seemed like every time we'd have a positive play we'd end having a penalty or move ourselves back. "I was not pleased at all with my feel for the flow of the game and kind of making adjustments as the game unfolded into giving ourselves some chance to have success and put some points on the board. "Credit to them they did a good job, I certainly didn't do good enough for us. We really just didn't have a chance to get anyone going offensively and that starts with me. "[The] defensive coaches put together a great plan, I thought the players played with urgency and awareness and great concentration throughout the game, that's a really tough offense and they did a nice job presenting a variety of different looks. "They made some plays in crunch time but I really loved the way that our defense competed and that's that's where I really feel I let our team down because of the way that our defense played." McVay pointed to a holding call on center John Sullivan that nullified a 13-yard Todd Gurley run on the drive prior to the Patriots' touchdown as a decisive moment. "I thought the holding call was a really tough one for us where we had a good drive going," he added. "Todd makes a nice cutback on a tight zone, and then it [the penalty] puts us at first and 20. "Those type of plays presented themselves throughout the night, it never enabled us to get into a rhythm, that was really tough."